Are we already up to G? G as in Feline Greenies and also as in ghetto. 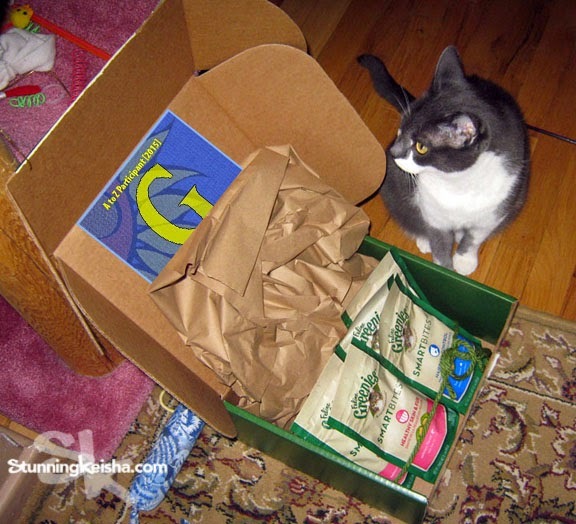 This little ghetto kitteh sure loves her Greenies SmartBites. I think they were the first freebies I ever got in the mail from a company and they were a huge success. To this day, they’re my favorite cat treats. I’ve been getting the Digestion ones lately since my hairball incidence until TW can buy the Hairball kind. But this isn’t a product review. This is my take on the Blogging From A to Z Challenge. I don’t take no guff from the cheap seats. Just gimme my Greenies and no one gets hurt. Each day during the A-Z Challenge, I’ll be spotlighting adoptable cats from A to Z. If you have any fosters, rescues or cats that need to be rehomed and you want them featured here, drop me an email or message the Stunning Keisha page on FB. Surely you know a cat who deserves a forever home. Today G is for Gino, a 2 1/2 year old male kitty. Can you believe this handsome kitty was returned to Great Plains. It gives me flashbacks to when I was returned to my shelter years ago. The floor is yours, Gino. Photos courtesy Great Plains SPCA. Hi there. I’m Gino and so glad to meet you. As you can tell from viewing my picture, I'm a very handsome boy with medium to long black, luxurious fur. I am a very responsible boy, in that I maintain my coat quite well myself, but would love a little help now and then from a human—that's YOU! You see, brushing is more than just keeping my coat in tip top shape, it's a little bit of loving at the same time. And usually we can have a very nice discussion during this time as well. I was adopted from Great Plains a while back with my sister. We got along great while we were here, always cuddling and playing together. But when we got to our furever home, I became jealous whenever Lila got attention and I didn't. So it may be best if I go to a home where I can be king of the castle and get all the attention. I'm very mild mannered, well behaved, and love to play. I think I'd make a fine addition to your family, don't you? Please come visit me soon. I'm hoping for a true forever home each and every day. For more information on handsome Gino and a complete listing of their adoptable cats, go to the Great Plains SPCA, Merriam Campus website. Have you missed any of our Blogging A to Z posts? You can find them all here. We are big Greenies fans here too! Gino looks a lot like Smokey! Our guys love Greenies too. Gino and Smokey both look like my Angel Rose - beautiful kitty! Wish we had them over here. Have a wonderful Wednesday. TKS loves greenies. I ate them a couple of times but now I am totally a Friskies Party Mix girl. And Gino is one handsome cat!! That gray undercoat is just stunning! Will share him. Looks like you hit the Greenies jackpot CK! You sure have a stash of Greenies. I hope the gum thief doesn't take those. Gino is a cutie- I hope he gets a forever home soon. 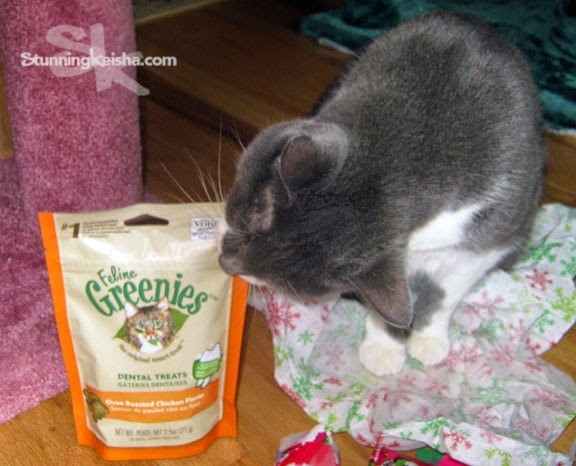 I never have had feline Greenies but Dakota LOVES the Greenies bones! Wow CK dat's a lot of gweenies to be sure. So glad yous like 'em. And dat Gino be ever so handsum, Weez shawin' and purrayin' hims get hims own home soon. What a hunk that Gino fella is! Wowie! Those were some good "G's"!!! Cinco and Manna agree that Greenies are delicious! It looks like you won't be running out any time soon :) Gino is a very handsome mancat! I love that fur. Hope that Gino will find his furry own foreverhome real soon ! We agree about the Greenies. "Chase the Greenies" is one of our favorite games these days. Gino looks like a very handsome boy, and he's going to be someone's special one-and-only. We like all kinds of treats. We hope Gino finds a wonderful forever home very soon. We can't get Greenies here but Derby used to send them to us a few years ago. Eric loved them, me not so much. Jack our ginger boy is an huge Greenies fan - so we are with you on that one CK! Greenies are our favorite treats too. Well, still no Greenies here for Callie yet. I try to buy her something new each week when I go grocery shopping so she got mousey toys this week. Gino is quite handsome! I love his mane.